Ocala has one of the best collections of old time Florida houses in the state. 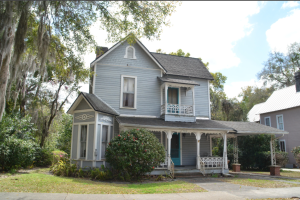 If you are a fan of Victorian architecture, both Ocala and Gainesville have some real beauties! Instead of the Mickey and Minnie routine, take a step back in time and enjoy Old Florida. OVER 130 YEARS OLD, THE CITY OF OCALA IS RICH WITH HISTORY. Ocala’s name comes from the extinct Timucuan Indians who called their village Ocali, commonly thought to mean “Big Hammock”. Today, many of Ocala’s streets have historical Indian names, while others have Spanish names from old land grants. Ocala was developed as a result of the Indian Wars in which Fort King played a strategic role. In 1846 Ocala became the county seat of newly formed Marion County (honoring General Francis Marion). By 1847 settlers constructed a courthouse on the square, the post office moved to Ocala, and a weekly newspaper was established. By 1858 Ocala was one of the leading social and business centers in Florida. The civil war all but destroyed business in Ocala, and the population dwindled to about 200 people. In 1880 Joseph Caldwell platted a 50 block area southeast of the original city plat on land that had been part of the 1817 Alvarez grant. The road from Ocala to Fort King ran across this land. The center of town was virtually destroyed by fire on Thanksgiving Day in 1883. In rebuilding, brick and other fire resistant materials were used instead of lumber. Thus, Ocala became known as the “Brick City”, a name still used today. According to the 1885 Charter of Ocala, the Town of Ocala was locally incorporated in 1868; stated approval was granted on February 4, 1869. At the time of incorporation, the city limits were set 1000 yards in all directions from the downtown square. By 1890, Ocala had expanded to four square miles and its population had increased to 1,895; it was the fifth largest town in Florida. 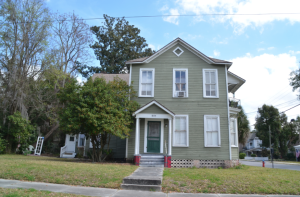 Early homes in Ocala were constructed within a few blocks of the Court House Square, and are now part of the Ocala and Tuscawilla Park Historic Districts.